912828H45, a new issue with the coupon rate to be determined at auction. This auction will come amid a lot of turmoil in financial markets, with Treasury yields plummeting while the stock market shows a lot of volatility. Our current trend of very low inflation (and even deflation) is also reducing demand for Treasury Inflation-Protected Securities, an investment that hedges against unexpected future inflation. Bloomberg’s Current Yields page shows a 9-year, 6-month TIPS currently trading with a yield to maturity of 0.23%. The Wall Street Journal’s TIPS Closing Prices page shows that same TIPS closed yesterday with a yield of 0.24%. The Treasury’s Real Yields Curve page estimates that a full-term 10-year TIPS would yield 0.29%. So at this point, with the auction a week away, it appears this new TIPS issue will get a coupon rate of 0.250% and a real yield (after inflation) a bit higher than that. A year ago, a 10-year TIPS went off with a yield of 0.661% – about 37 basis points higher. In fact, only one auction of a 9- to 10-year TIPS in the last nine went off with a yield below 0.30% – on July 24, 2014, with a yield of 0.249%. This is CUSIP 912810FR4, a 20-year, 6-month TIPS that was first issued July 15, 2004. If you bought that 10 years ago (I didn’t, unfortunately) you are loving that 2.375% coupon, which you earn in addition to inflation. 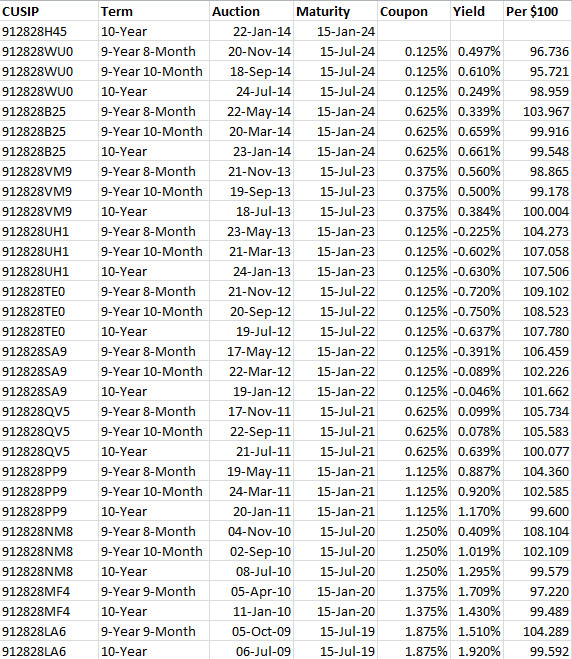 I’ll just note that a 30-year nominal Treasury is yielding about 2.47% this week. This TIPS might yield slightly higher than the new one coming next Thursday, but it comes at a lofty cost: About $120 per $100 of value plus 25% in inflation appreciation. Ouch. And I wouldn’t want to be buying inflation appreciation at a time when we face several months of deflation, which will reduce the accrued principal. But ‘cheap’ doesn’t necessarily equate to ‘attractive.’ A yield of 0.29%, plus inflation, on a 10-year TIPS isn’t very attractive. In fact, just two months ago, a 4-year, 4-month TIPS went off with a yield of 0.395%, 10 basis points higher. The rates are horrible, but is there some kind of market neutral straddle where you could make money by “betting” on the inflation spread being unrealistically low, which I think we agree is the case? It looks like these launched in Feb. 2012 and were discontinued in December 2014. They were leveraged 2x and 3x – long and short – so they were for big bets. I don’t think there is anything else out there like this today.